The appetite of many preschoolers can be as endless as that of the famous Cookie Monster on Sesame Street. Like the puppet hero, your child may not be aware of why he wants more food than he needs. But you need to understand his motivation in order to get his eating habits back on track. Because overeating is a symptom of a problem, not the problem itself, try to discover the reasons behind your child’s seemingly bottomless pit. Possible explanations include habit, boredom, mimicry, or the desire for attention. Help him find ways to satisfy his needs and wants without overeating. Note: Get professional help if your child is a consistent overeater. Avoid diets that are not medically supervised. Model a healthy attitude toward food. Your relationship with food is contagious. When you complain about dieting or being too fat, for example, your child learns that food has power beyond making him healthy. Food becomes the enemy to defend against, lest he lose control and pig out on a forbidden chocolate cake. Since moderation is the key to health, moderate your talk as well as your behavior. Eating disorders in young children have become more prevalent, due in part to our dieting-obsessed culture. Become well versed in what’s appropriate for your child. Growth rate, activity level, and physical size determine how many servings from the five food groups (milk, meat, vegetable, grain, fruit) a child needs each day. Consult your child’s health-care provider for answers to specific nutrition questions about your child. For more information about recommended guidelines for one- to five-year-olds, consult the National Dairy Council’s website at www.nutritionexplorations.org. Keep both high-calorie and empty-calorie foods out of your overeater’s reach so he won’t be tempted to grab for them. Since your preschooler is too young to know what he should and shouldn’t eat, it’s up to you to establish healthy eating habits, the earlier the better. Foods high in fat and sugar should be replaced with those high in protein, vitamins, and minerals, to offer a balance of nutritious calories in a day. Teach when, how, and where eating is allowed. Provide pleasurable activities other than eating. Get to know what your child likes to do besides eat, and suggest these activities after he’s eaten enough to satisfy his hunger. Show him how delicious things other than food can be. Don’t offer food as a present or reward, to avoid teaching your child that eating means more than satisfying hunger. A well-timed snack can prevent your child from getting over-hungry and gorging at mealtime when it finally arrives. Watch when your child overeats. 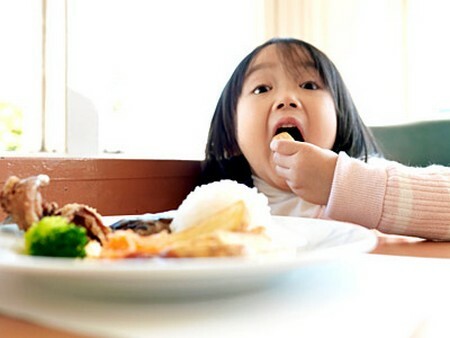 Try to discover why your child overeats by seeing if he turns to food when he’s bored, mad, sad, watching others eat, or wanting attention from you. Help him resolve his feelings in noneating ways like talking or playing. Communicate with him about trouble spots in his life so he won’t be tempted to make food a problem solver. Control your own eating habits. If parents snack on empty-calorie junk foods all day, their children will be inclined to do the same. Overweight children often don’t eat any more than normal-weight children; they just don’t burn enough calories off through exercise. If you live in a cold climate, suggest physical activities to play inside in the winter, like dancing or jumping rope. In the summer, activities such as swimming, walking, baseball, and swinging are not only good for your child’s physical development, they also relieve tension, give him fresh air, and build coordination and strength. Your participation will make exercise even more fun for your child. Make sure the encouragement you give your child to eat all his peas isn’t the only encouragement you ever give him. Praise his artwork, the clothes he’s chosen, the way he’s cleaned up his toys, and so on to give him attention for things other than eating and overeating. Don’t give in to his desire to overeat. Just because your child wants more food doesn’t mean he needs it, but don’t make him feel guilty for wanting more by making fun of him and calling him “Little piggy” for example. To learn healthy portion sizes, consult the National Dairy Council’s website at www.nutritionexplorations.org or ask your child’s doctor for a nutrition plan. After you’re sure your child has had enough, briefly explain why he shouldn’t have more, because he’s too young to tell himself the reason. Don’t give treats when your child is upset. Your child may begin to associate food with emotional rather than physical nourishment if you consistently offer treats to ease his pain. Don’t consistently allow food while you’re watching TV. Avoid teaching your child to associate food with TV. Because television advertising bombards your child with food messages, it’s also a good idea to limit his television viewing time. Don’t give junk foods as snacks. What you allow for snacks and meals is what your child will expect. Food preferences are learned, not inborn. Don’t make fun of your child if he’s overweight. Making fun of your child only compounds the problem by adding to his guilt and shame.